We issue our Newsletter 3-5 times per year and post a link to view or download it on this web page, along with occasional Action Alerts. Or, you can Subscribe to receive our Newsletter and occasional Action Alerts automatically. UPDATED 4/15/19: The government did not respond to our February 8 60-day notice so on April 15, 2019, Earthjustice filed a lawsuit on our behalf in U.S. District Court in Missoula, MT. Click here for our Court Complaint. Click here for our 4/15/19 press release. Click here to read the Missoulian article in this matter. 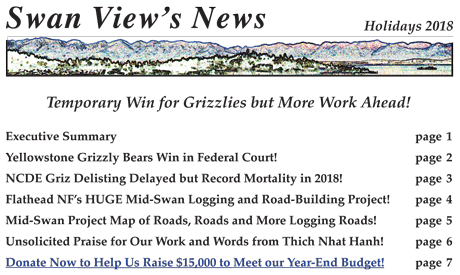 Swan View Coalition and Friends of the Wild Swan have filed a 60-day notice that they will file suit over the Flathead Forest Plan's abandonment of key protections for threatened grizzly bear and bull trout! 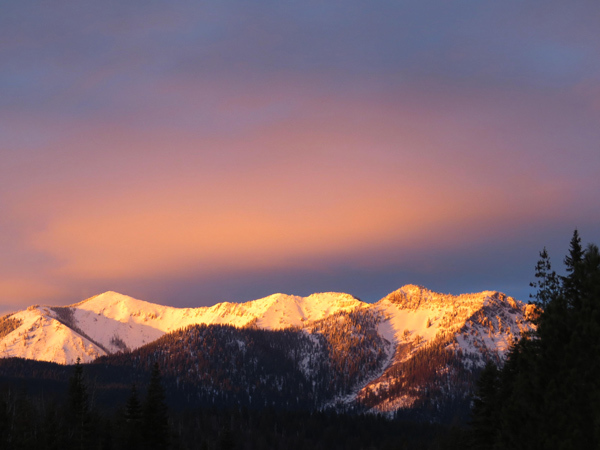 The photo above was taken by the Flathead National Forest of its logging road 10753. It considers this road so well "stored" and "impassable" to motor vehicles that it need not be counted as a road in total road density - as though it does not continue to impact fish and wildlife! Mandatory limits on the road system that were in the prior Forest Plan's Amendment 19 have been fully abandoned in the revised Plan. The Flathead no longer has to decommission old logging roads and remove culverts in order to protect grizzly bears and bull trout, even though research shows bears are displaced by even closed roads and bull trout suffer from the sediment produced by roads. The Flathead recently revealed what it thinks it can get away with under its revised Plan. Its Mid-Swan Landscape "Restoration" Project would build 60 miles of new permanent logging roads and an unspecified mileage of "temporary" logging roads! In contrast, under Amemendment 19, the Flathead built only 3.2 miles of new road since 1995. Earthjustice has agreed to represent us in this matter! Click here for our Notice of Intent to file suit. Click here to read the Kalispell Daily Inter Lake's article in this matter. Click here for good reasons to doubt the government's claims that grizzly bears are "recovered" in the Northern Continental Divide Ecosystem. As the sun sets on 2018, don't think for a moment that the government is shut down! On December 21, Winter Solstice, Trump issued an Executive Order directing increased logging on Forest Service and Bureau of Land Management lands under the guise of controlling wildfires - even though hundreds of experts have warned logging will make matters worse. The EO instructs the agencies to use existing shortcuts in environmental reviews and to create new shortcuts. You can read or download the EO here or the warning letter from 200 scientists here. Two days after Christmas, the Flathead National Forest published its Final Record of Decision for its revised Forest Plan. In the same Federal Register notice, the Forest Supervisors of the other Forests in the Northern Continental Divide Grizzly Bear Ecosystem issued Amendments to their Forest Plans. The Flathead Plan and other Plan Amendments all remove or greatly relax management standards that were in prior plans to protect the threatend grizzly bear and its habitats from road building and logging. We wish we had better news to share, but we wanted to let you know that we aren't asleep at the switch even though the government may be pretending to be! With you by our side we intend to meet these challenges head-on in 2019! Your continuted support of our work is greatly appreciated! 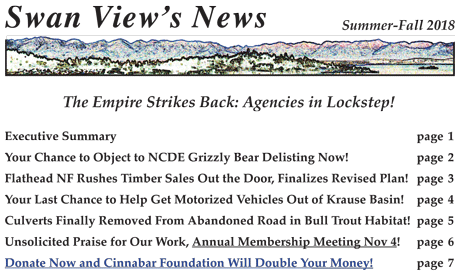 January 7 update: Click here to read a Hungry Horse New Article chastising the Flathead for not making the release of its revised Forest Plan known publicly. 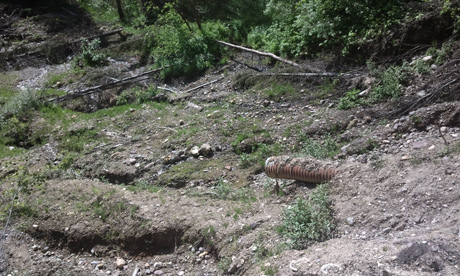 The article also notes that the current Forest Plan's road closure and decommissioning program for grizzly bear security, Amendment 19, had also restored water quality in Big Creek and gotten it removed from the list of "impaired" watersheds - but that Amendment 19 is abandoned in the revised Forest Plan! May you find yourself among friends and family and doing things you love! Thank you for your kind words and support in 2018! 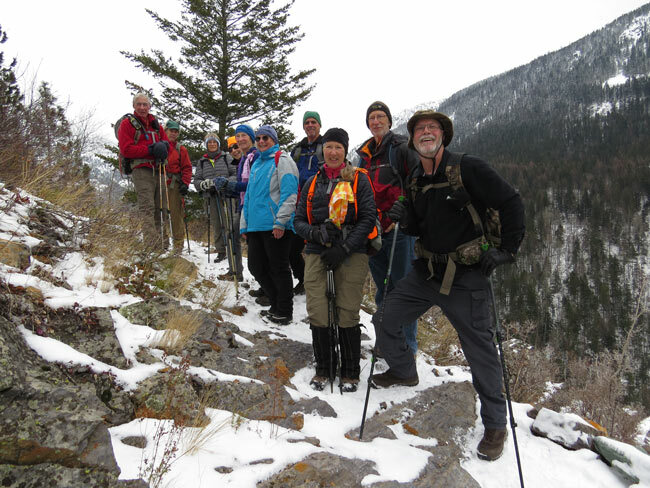 To make matters worse, the revised Flathead Forest Plan is due to be issued by Christmas. It would strip existing protections from grizzly bear habitat regardless of whether ESA protections are lifted - unless we stop it! So please join others in supporting our work to protect habitats for wildlife, fish and people! A big THANK YOU to those who made donations matched by Cinnabar Foundation! Won't you join them and DONATE NOW to help us meet our year-end budget? The Court's recent restoration of ESA protection to the Yellowstone grizzly bears does not stop the planned removal of those protections in the Glacier/NCDE area! We need your help to continue fighting delisting of the NCDE grizzly bears, including at this week's hearings in Missoula and Kalispell! While the Court in the Yellowstone case just gave government agencies good advice on how NOT to proceed in the NCDE delisting process, that doesn't mean the agencies will heed it. It is important that you show up at hearings, send in comments and send letters to newspaper editors saying you want continued ESA protections for grizzly bears! The Yellowstone Court ruling supports our position on the NCDE, so please revisit our Action Alert and provide comments to MDFWP this week! Montana Dept. of Fish, Wildlife and Parks is trying to write into law that it will maintain 800 grizzly bears in the NCDE/Glacier-Bob Marshall area, fewer than the 1,000 thought to exist today and far fewer than the 5,000 bears population viability experts say need to exist in an interconnected ecosystem in order to maintain genetic diversity! This would be one of the final steps in removing Endangered Species Act protections from the bear (delisting)! You can help by sending an email, writing a letter, or attending a meeting next week in Kalispell or Missoula! Comments are due by October 26. If you live nearby, please speak up at a meeting in Missoula on Sept. 26, 6:30pm, Holiday Inn Downtown, 200 S. Pattee St. or in Kalispell on Sept. 27, 6:30pm, FVCC Arts and Technology Bldg., 777 Grandview Drive! 1. A 90% probability of maintaining 800 bears in the NCDE core is an inadequate target. 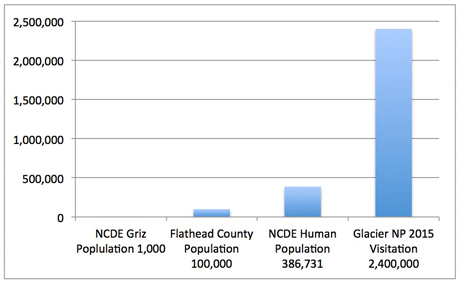 How many bears and how much habitat is needed for a single, connected population in the Yellowstone, NCDE, Cabinet-Yaak, Selkirks, and Selway-Bitterroot ecosystems? 2. The "lower 48" grizzly bears were listed under the ESA as "threatened" with extinction. Why are MDFWP and U.S. Fish and Wildlife Service trying to "divide and conquer" rather than "connect and recover" these ecosystems? 3. Grizzly bears are currently confined to about 2% of their former range and numbers. MDFWP should be ashamed to try and write into Montana law that this constitutes bear "recovery." 4. Grizzly bear hunting would kill bears needed for population expansion and ecosystem connectivity. If you want to write a law, make grizzly bear trophy hunting illegal in Montana forever. For more background, see page 2 of our Summer-Fall newsletter. For more talking points, see our recent letter to the editor. For information on MDFWP's proposed law or to comment on-line, click here. THANK YOU for taking a moment to speak up for grizzly bears!